I have written many times on the blog about climate change either explicitly (“America’s Knowledge of Climate Change”) or implicitly (“Green Business: The Case of the Nissan Leaf”). However, the recent hot weather prompted me to address two issues. First, “global warming” is different than “climate change”. The U.S. Environmental Protection Agency defines “global warming” as “average increase in temperatures near the Earth’s surface” while maintaining that “[g]lobal warming can be considered part of climate change along with changes in precipitation, sea level, etc.” (source). That is, climate change means many different and varying outcomes across the globe. Second, weather is different than climate. A heat-wave during one summer is a weather event (albeit an unpleasant one). Other rare weather events have occurred this year, for instance the recent dust-storm or Haboob that hit Phoenix, AZ (source). To highlight the distinction between weather and climate, Figure 1 plots the annual global temperature deviation from the long-term trend with the total deviation range approximately 1 degree Celsius (C). This figure is a recreation of a Nation Oceanographic and Atmospheric Administration (NOAA) figure from climate.gov meant to show an increase trend in global temperatures, with the largest positive deviations in recent years. 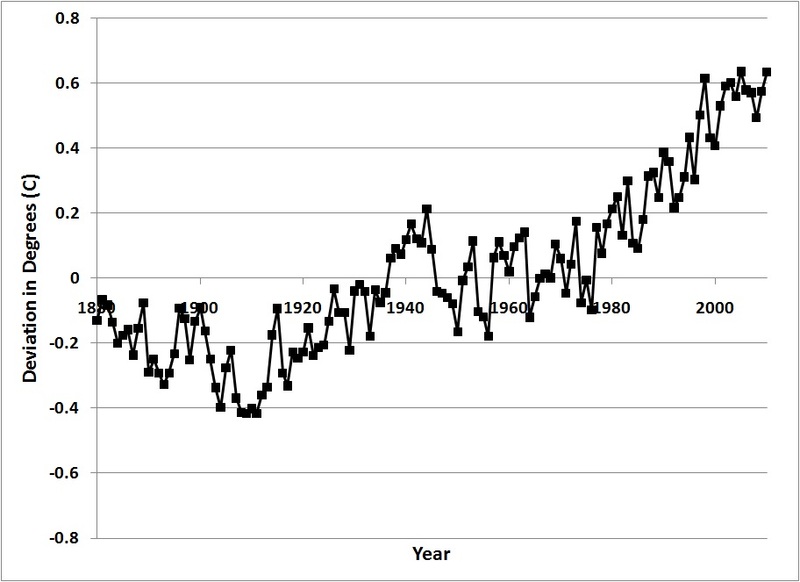 There are many different objects to using such a graph in climate change science, but that is not the issue here. Rather, I am using the figure to show that while extreme weather might happen in one part of the world at any given time, the average global weather – a.k.a. 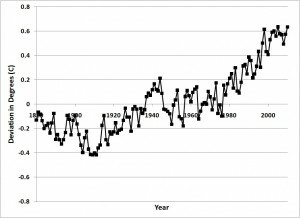 climate – has remained within a fairly narrow band of temperatures. Debates about climate change and environmental policy are important, but do not let weather cloud one’s judgment!